Activities and events that bring awareness and education regarding the impact of teen use of drugs and alcohol and gang involvement in our county. In 2012 FACTOR and AVPRIDE joined forces for the Alcohol Prevention Project. dissemination in middle school, we are choosing to most heavily focus on middle school students in our selected communities. 1. The lack of systemic education of youth about alcohol. In particular, there is a glaring gap in almost any meaningful discussion of alcohol in school between 5th and 9th grades – a critical time when youth are both barraged by pro-alcohol messages, and making individual choices of whether to use alcohol. 2. The parental acceptance of underage drinking, and its manifestation in the social hosting of parties where alcohol is provided to underage youth. 3. Community Readiness scores of 2 and 1 in our key communities. check AVPRIDE website for information on upcoming meetings and view our PSAs and TV series on consequences of underage drinking. Our chosen state priority goal: reduce the onset of early alcohol use among 9-20 year olds in Fayette County. Train your employees to check IDs, recognize what's too much, the proper way to deny when a patron has had too much to drink. FACTOR has partnered with AVPRIDE to address the issue of Under Age Drinking in Fayette County. 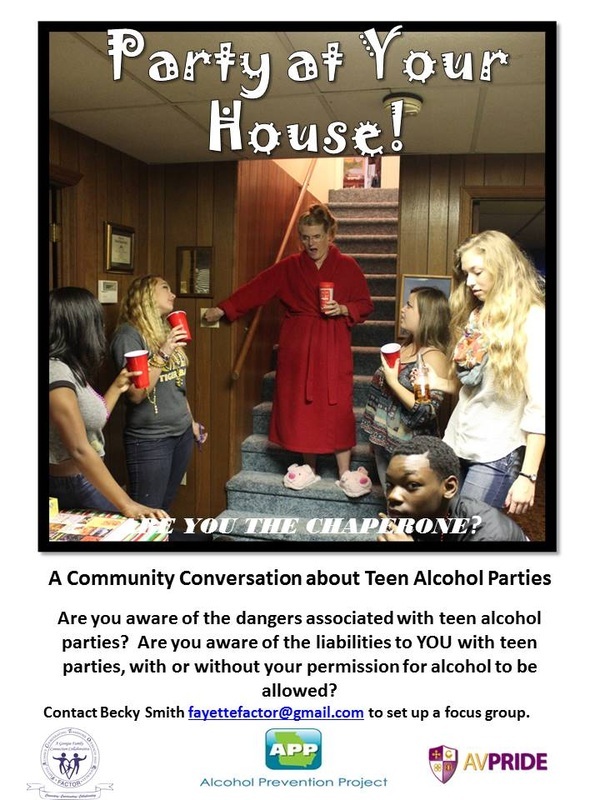 AVPRIDE, a local youth serving organization, is a designated provider for the statewide Alcohol Prevention Intiative. What Do YOU Know About Social Hosting? Invite US to a Party at YOUR House to have a Community Conversation!